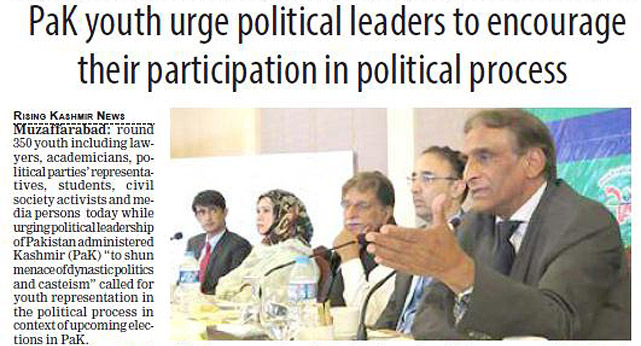 Centre for Peace and Development and Reforms (CPDR) organised a daylong policy dialogue on role of political parties in promoting decision-making spaces for young people of AJK in the context of upcoming elections. Almost 350 young people actively participated in the interactive discussion. Here is what youth stated about event. It’s a feeling induced in me from a very tender age that the relationship between the state subjects of erstwhile Jammu and Kashmir isn’t a political or national relationship but a relationship of pain and common suffering. It’s a relationship of lost identities. This pain of separation has had various forms of expression. A heated debate is going on regarding the long-awaited constitutional rights of people of Gilgit-Baltistan nowadays in the national as well as regional media. Differing narratives and shades of opinion are being expressed, which are gradually intensified and got hype.